When I import image in Storyline (Insert -> Picture from file) -- the Storyline automatically expands the image on the full slide width. Thus, I cannot avoid adjusting image size. What would be the workaround then? I understand how exasperating it is on your part and nobody wants to experience that as much as possible. In my opinion, it seems that it has something to do with aspect ratio. I would check that part and if it's locked. - on the uploaded picture, right click on it, then click on "Size and Position"
After which, try inserting a new picture and see if it works. Hope that helps otherwise, please do not hesitate to reach out. I am sure we will be able to get help and advice from our community experts. My problem is that I cannot figure out how to preset the image to avoid Storyline automatic scaling when importing it, it happens without me being able to control it. So the user-manual recommendation is not feasible for me: I have to rescale the image in Storyline anyway if I do not want it to fill the slide completely and then it is ruined in quality. The only reason an image should scale in Storyline is if you inserted it at a larger size than your slide, and we'll scale it to fit. If you have inserted a smaller image, are you seeing it stretch to fit the slide? If that's the case, could you share the image with us and let us know what slide dimensions you're using? That will allow us to do some testing around it. Image stretches to fit the slide when I insert it as a file from image, or a copy-paste from screenshot directly. But it does so in Powerpoint too without any quality loss.. In SL It looses the quality dramatically in both cases, as well as being imported from photoshop. Unfortunately the image specifically does not matter - it happens with any image. I cannot share it for internal reasons but I can share a fragment of how it looks in Microsoft powerpoint (when importing as a file or copy from screenshot - just the same what I do in Storyline) versus the Storyline. You can see how SL dramatically reduces by default the quality of image. This is a HUGE hurdle for us. Could you please escalate the need to resolve this issue? I'm thinking the blurriness you're seeing has something to do with the Modern Player scaling up to fit the browser/Preview window. This scaling causes the slide size to increase, and that could result in image quality loss. 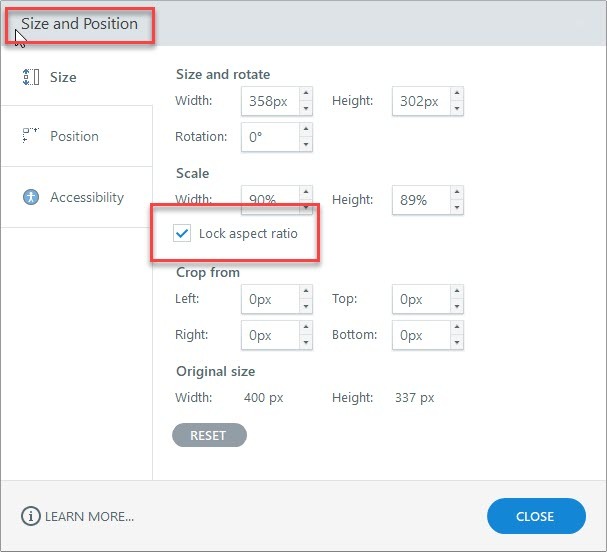 As a quick test, try switching to the Classic Player, and choose the Lock player at optimal size setting. Do you notice a difference when the slide size is locked and unable to scale up? I use classic player with it now and it behaves the same unfortunately. Please see the blurriness again in the fragment. I am in contact with the Support too, however they claim they cannot replicate the issue on their side, which leaves me helpless with those facts on my hands. I took a look at your case as well, and I've asked our senior Support Engineers to take a look too. They'll be in touch once they've reviewed your case further so that we can figure out the differences in what you're seeing vs. what Angelo saw in his testing. "We currently have a known issue with images appearing blurry only when a course is being viewed in Google Chrome. this issue has been included in our internal hotlist and our Product team is working hard on a future fix. Unfortunately, I am not able to approximate when a fix will be available. Rest assured I will send you an update if a fix is available for this issue." Thanks so much for popping back in and sharing an update with the community, Irina. This is not only a Chrome issue. It happens for us in IE as well. Following all the best practice instructions and setting the image to the correct size and dpi actually makes it worse. We use the classic player and don't want to lock the player to optimum size. We only use html5. This is very frustrating. We source good quality images only to have them blurred by storyline. This issue has been going on for quite some time, some threads going back to 2017. Please fix. We'd love to take a look at your file to see if there's another reason for the image quality issues you're seeing in Chrome and Internet Explorer. If that works for you, you can upload your file privately to our support team here. We'll give it a test and let you know what we find! Would it help to use a picture placeholder? Sorry for the tardy reply. Sorry I can't share my file. This is an issue with Storyline and has been for some time. I think that instead of trying to fix each individual case, as there are many, Articulate should focus on the why storyline is doing this and sort it out. I had occasion to put the same image into a rival program and had no problems with it. I put it into Rise and have no problem with quality. Please concentrate on fixing ongoing problems before inroducing new features. Storyline is already feature rich and I'm sure all users would forgo new features for a time while Articulate made sure the software worked proberly in all aspects. In a similar thread in Rise 360 we were told that dealing with the image quality in Articulate is not a priority due to the fact that some folks consider the image quality satisfying enough. What has to happen so that this problem will receive a top priority? How many users have to vote for it? This is a recurring systemic problem, so there is no point to share a specific file with support. I had to erase part of the image for security reasons. If this is not urgent to fix I do not know what urgent is. How am I supposed to present it to our stakeholders? You recently received an email from John, a Senior Support Engineer, with some updated information on your file. I'm following along in that case, so we can keep the conversation going there if you'd like! Thank you very much for getting back to me, I replied to John and sent him that image from my last comment. I appreciate a lot your help! Hey everybody. I'm excited to let you know that we just released update 26 for Storyline 360! Here are all the details. We addressed an issue where text and images could be blurry when viewing a course in Google Chrome or Safari. Here’s how you can update Storyline 360 to take advantage of everything the latest release has to offer. If you need more help, please let me know! Thank you very much for the update! I have downloaded it and am very happy to see the massive improvement for my trouble: I attach a snapshot from the classic player, it looks much crispier now! That's so great to hear, Irina! And we appreciate you for working with John prior to the update. If there's anything else we can do to help, don't hesitate to reach out! Hey there, David. Thanks for letting me know. What browser are you using to view the HTML5 output? Thanks, David. Our team hasn't seen the same reports of blurriness in Internet Explorer 11, as we saw in Chrome or Safari. Could you check what update of Storyline 360 you're publishing with ( You can check by going to the "Help" Tab -> "About Articulate Storyline") and if you're able to share a link to the course here that would help us with testing! If you need to share that privately, our Support Team is available to take a look too. "Sorry for the tardy reply. Sorry I can't share my file. This is an ..."
"Hi Irina, You recently received an email from John, a Senior Suppo..."